This is the first in a series of articles that will discuss issues related to hazardous materials in the workplace. Pharmacists and nurses know that chemotherapy can be dangerous, but many are unfamiliar with the large body of research documenting the magnitude of workplace contamination, extent of chemical absorption (worker exposure), and downstream effects these chemicals may exert on healthcare workers. While oncology pharmacists are good at discussing new trial data, rarely do they chat about the recent urinary excretion or chromosomal damage study in exposed healthcare workers. When studies documenting the risk of hazardous medications are published in major oncology journals every other year or so, they are hardly ever accompanied by a summary of the current recommendations and regulations. The variety of guidelines and regulatory publications available can make full comprehension and application difficult, with information that can be too broad or too narrow. Chemotherapy drugs constitute the majority of hazardous drugs as defined by the National Institute for Occupational Safety and Health (NIOSH)1 and other organizations. Obviously, these chemotherapy and other drugs provide a therapeutic benefit to patients, but may pose health risks to workers who must handle them on a daily basis. Because most chemotherapy drugs are nonselective in their mechanism of action, their adverse effects have been well recognized in patients. Additionally, similar adverse effects have been observed in healthcare workers who prepare and administer these drugs. The effects can range from acute, such as skin and mucous membrane irritation, headache, and hair loss, to more long-term effects, such as adverse reproductive outcomes (spontaneous abortion, teratogenicity) and genotoxic effects (chromosomal and other genetic damage) to possible cancer.2,3 In fact, the healthcare setting has a large and diverse mixture of chemicals that are genotoxic, teratogenic, reproductive hazards, and carcinogenic. While many embrace safe handling and integrate it into their workday, pharmacy personnel have likely encountered a coworker who balks at safe handling. We all have had more than one coworker say “I have worked with chemo for years and I am fine” as well as “I never gowned when I mixed, and here I am.” It is important to explain to such individuals that epidemiologic studies determining the risk of exposure require large study populations to detect significant effects, much like oncologists not relying on the efficacy results of a treatment regimen evaluated in one patient without a control group and a sufficient study population. Changing the views of resistant personnel is critical to the environmental protection of all staff. Employee knowledge of management support and assessment of compliance with safe handling guidelines are integral, because a single employee or incident resulting in environmental contamination can function as an indirect source of contamination for the other staff working in the area. Many studies have examined the excretion of hazardous drugs in the urine of exposed healthcare workers. One such study, published by Wick and colleagues in the American Journal of Health-System Pharmacy in 2003, uncovered some long-lasting effects of contamination.9 The study was designed to detect reduction of personnel exposure after implementation of a closed-system transfer device (CSTD) and evaluated the urine of nurses, pharmacists, and technicians, including noncompounders. Of the urine samples analyzed prior to implementation of the CSTD, 21% were positive for ifosfamide and 38% were positive for cyclophosphamide. The facility’s compounding diary last documented ifosfamide as being compounded 3 weeks prior to the initiation of urine collection. Ifosfamide and its metabolites are primarily excreted in the urine, and the human half-life is 3 to 10 hours. Though the authors’ focus was on the efficacy of the CSTD, one may conclude that before or at the time ifosfamide was last compounded, an event resulting in environmental contamination with the drug occurred. Unknown to the staff, this source of contamination persisted and functioned as a means of indirect exposure. This reinforces the necessity of complying with safe handling guidelines by all staff members regardless of their personal perspective, because one employee’s actions can affect other employees’ exposure. Surprisingly, the essentials of safe handling have remained generally the same since the OSHA Technical Manual was published in 1995: proper facilities, engineering controls, personal protective equipment (PPE), and technique, coupled with education, environmental monitoring, and medical surveillance. With so many published studies documenting contamination of the workplace and exposure of workers, and the availability of new safety products, it is alarming that noncompliance persists in some facilities. Polovich and colleagues have investigated nurses’ use of handling precautions and identified staff characteristics and organizational factors that influence compliance.10,11 An individual’s knowledge and perception of exposure and risk, including proper technique for using PPE, greatly affect that person’s compliance. Organizational factors include management’s perceptions of the value, whether employee compliance is being enforced, and availability of PPE. Friese and colleagues recently reported on factors that contribute to workplace exposure and concluded that “the likelihood of exposure decreased when nurses reported adequate staffing and resources…and when nurses reported that chemotherapy doses were verified by two nurses frequently or very frequently… .”12 Moreover, as workload increases, compliance with safety procedures decreases. Therefore, if the main barriers today are education of healthcare professionals and lack of compliance because of workload, it should be our goal to educate staff and fight against desensitization to risk in the workplace. Although all the criteria for a hazardous drug are of concern to health and safety professionals, the possibility of cancer appears to receive the most attention from healthcare workers. There are more than 20 chemotherapy agents associated with secondary malignancies in patients, and dozens that are carcinogenic in laboratory studies.13 Furthermore, the vast majority of chemotherapy drugs are genotoxic, which can contribute to the primary or subsequent mutations necessary for the process to progress. Focusing on the mechanism of damage caused by hazardous drugs will increase knowledge and potentially change perceptions and increase compliance. When discussing the carcinogenic and genotoxic potential of compounds, it is important to appreciate that current evidence supports a multistage process of carcinogenesis. Simply expressed, cancer does not develop from a single exposure or DNA alteration, but rather results from a series of events that can lead to cellular immortality. Cancer has a long latency period. DNA changes can be caused by an inherited mutation or exposure of a normal cell to radiation, viruses, or carcinogens, which, if not repaired, can lead to irreversible cellular mutations that alter cellular response to the environment and may confer a survival advantage. This process can be mediated by carcinogens, other chemicals, or environmental factors that favor the growth of the mutated cells and may occur over decades. Mutated cells undergoing a selective clonal expansion can lead to transformation or conversion, whereby accumulation of genetic changes leads to cell deregulation and increased proliferation. While less than 5% of chemotherapy drugs have been evaluated for workplace contamination, current and past research provides a solid rationale for existing recommendations about the dangers these drugs pose to healthcare workers and the need to adhere to proper workplace procedures. Surface contamination with carcinogenic drugs has been documented throughout pharmacy and administration areas and in all areas where these drugs are present.14,15 Hazardous drugs and/or their metabolites have been identified and quantified in the urine of exposed healthcare workers, including noncompounding staff.2,16,17 Genotoxic activity in healthcare workers has been documented by various techniques including chromosomal abnormalities, micronuclei, and comet assay studies. Researchers, including pharmacists and environmental toxicologists, have yet to show a direct correlation between increased surface contamination and increased genotoxicity, but continue to evaluate this matter. It is vital that all pharmacists—not just those practicing in oncology—educate pharmacy technicians and other staff about potentially hazardous drugs and work practices that could result in exposure. Pharmacists should lead by example, and have their actions guide others as to how to work with these potentially harmful drugs. Patients receive concentrated doses of a limited number of agents for a defined period of time. Healthcare workers are exposed to small doses of a broad range of hazardous drugs over decades, with some workers being exposed every workday, year after year. Pharmacists and other healthcare workers may be exposed to dozens of the more than 100 chemotherapy drugs now in use, besides the other nonchemotherapy drugs that have been identified as hazardous. Given what is known about the potential hazards of these drugs for workers, it is most prudent to be aware of, and to adhere to, existing safe handling guidelines in addition to keeping up-to-date on training and the latest improvements in safety equipment. 1. National Institute for Occupational Safety and Health. NIOSH list of antineoplastic and other hazardous drugs in healthcare settings 2012. http://www.cdc.gov/niosh/docs/2012-150/. Published June 2012. Accessed April 22, 2013. 2. National Institute for Occupational Safety and Health. NIOSH Alert. Preventing occupational exposures to antineoplastic and other hazardous drugs in health care settings. www.cdc.gov/niosh/docs/2004-165/. Published September 2004. Accessed April 22, 2013. 3. Connor TH, McDiarmid MA. Preventing occupational exposures to antineoplastic drugs in health care settings. CA Cancer J Clin. 2006;56(6):354-365. 4. Occupational Safety and Health Administration. Controlling occupational exposure to hazardous drugs. http://www.osha.gov/dts/osta/otm/otm_vi/otm_vi_2.html. Published January 20, 1999. Accessed April 22, 2013. 5. American Society of Health-System Pharmacists. ASHP guidelines on handling hazardous drugs. Am J Health Syst Pharm. 2006;63:1172-1193. 6. US Pharmacopeial Convention (USP) Revised Chapter (797) Pharmaceutical Compounding—Sterile Preparations. http://www.usp.org/store/products-services/usp-compounding. Accessed April 22, 2013. 7. Polovich M, Bolton DL, Eisenberg S, et al, eds. Safe Handling of Hazardous Drugs. 2nd ed. Pittsburgh, PA: Oncology Nursing Society; 2011. 8. American Society of Hospital Pharmacists. ASHP technical assistance bulletin on handling cytotoxic and hazardous drugs. Am J Hosp Pharm. 1990;47(5):1033-1049. 9. Wick C, Slawson MH, Jorgenson JA, et al. Using a closed-system protective device to reduce personnel exposure to antineoplastic agents. Am J Health Syst Pharm. 2003;60(22):2314-2320. 10. Polovich M, Martin S. Nurses’ use of hazardous drug-handling precautions and awareness of national safety guidelines. Oncol Nurs Forum. 2011;38(6):718-726. 11. Polovich M, Clark PC. 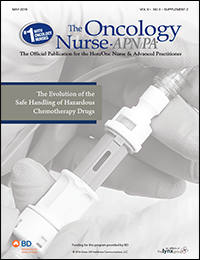 Factors influencing oncology nurses’ use of hazardous drug safe-handling precautions. Oncol Nurs Forum. 2012;39(3):E299-E309. 12. Friese CR, Himes-Ferris L, Frasier MN, et al. Structures and processes of care in ambulatory oncology settings and nurse-reported exposure to chemotherapy. BMJ Qual Saf. 2012;21(9):753-759. 13. International Agency for Research on Cancer. IARC monographs on the evaluation of carcinogenic risks to humans. http://monographs.iarc.fr/ENG/Classification/index.php. Updated April 10, 2013. Accessed April 22, 2013. 14. Connor TH, DeBord DG, Pretty JR, et al. Evaluation of antineoplastic drug exposure of health care workers at three university-based US cancer centers. J Occup Environ Med. 2010;52(10):1019-1027. 15. Hon CY, Teschke K, Chua P, et al. Occupational exposure to antineoplastic drugs: identification of job categories potentially exposed throughout the hospital medication system. Saf Health Work. 2011;2(3):273-281. 16. Turci R, Sottani C, Spagnoli G, et al. Biological and environmental monitoring of hospital personnel exposed to antineoplastic agents: a review of analytical methods. J Chromatogr B Analyt Technol Biomed Life Sci. 2003;789(2):169-209. 17. Suspiro A, Prista J. Biomarkers of occupational exposure to anticancer agents: a minireview. Toxicol Lett. 2011;207(1):42-52. The findings and conclusions of this presentation have not been formally disseminated by NIOSH and should not be construed to represent any agency determination or policy.